The Northern Lights Will Be Visible Over the U.S. Tonight. Here's How to See It. It won't be visible across the entirety of the United States, like the recent total lunar eclipse during a supermoon, but part of the United States may have the opportunity to chase that eclipse with a northern lights sighting. 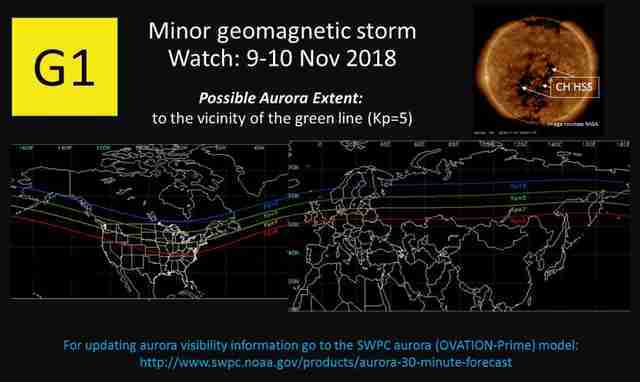 The Space Weather Prediction Center (SWPC) has issued a G1 geomagnetic storm alert for the night of January 23 "due to the influence of a positive polarity" coronal hole high-speed stream. That sounds complicated. If you just want to see the aurora borealis, you don't really need to concern yourself with what that means. Here's the short version: The bucket list spectacle will likely make itself visible over parts of the northern United States on Wednesday night. The SWPC, which is part of the National Oceanic and Atmospheric Administration (NOAA), is still running during the government shutdown, according to a note on its homepage, but there's no new map showing the potential extent of the aurora. However, the map above shows the reach during a previous G1 storm in late 2018. If the weather cooperates, you may be able to catch the display in parts of Montana, North Dakota, Minnesota, Wisconsin, Michigan, and Maine. Additionally, you should be able to spot it throughout Canada outside of small parts of southern Ontario, Quebec, and British Columbia. The video above shows the aurora borealis over the Mackinac Bridge in Michigan in early 2018 following a G1 watch from the SWPC. 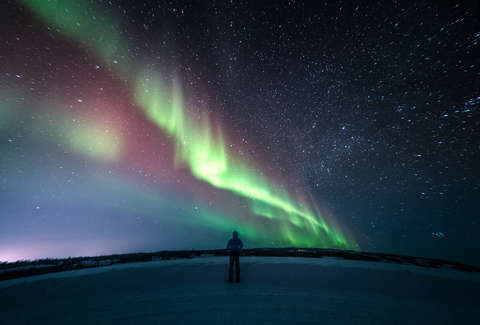 Under these circumstances, you might not have the brilliant ribbons of bright light you'll find in, say, Iceland, Alaska, Finland, or other northern regions, but it's still absolutely worth seeing. The SWPC's 3-Day Forecast has the G1 alert lasting from 8pm EST on January 23 to 2am on January 24. At the outset, it will likely be too light out for the northern lights to be seen, but once it's dark, the area above should have a good view until the end of that time frame. The joke is often made that you only need to look up, but it's not quite that simple for most people in the US. You need to get away from the light pollution of urban centers for a good look at the aurora. An SWPC representative previously told Thrillist, "You need very clear skies, a good view of the northern horizon (no trees, buildings, or hills), and it needs to be dark." You'll need a view of the northern horizon because, unless you're somewhere like Alaska or Iceland, the lights will only be seen along the horizon rather than directly overhead. It also helps to plan on being outside for a while, even though it's cold outside. Your eyes need time to adjust to the darkness in order to have the best view of the stars and everything taking place in the sky. The northern lights creep down to the US from time to time, but it's not a common occurrence and can feel even less common when you factor in that the weather needs to cooperate. Moreover, the solar cycle is near its minimum, making events like this occur with less frequency. That makes this a great opportunity to get outside and cross the northern lights off your bucket list.